Truly horrifying. al Furqan Media (aka Furqan Foundation for Media Production) and al Hayat Media Center have just released a video threatening the United States if it continues strikes against ISIS. 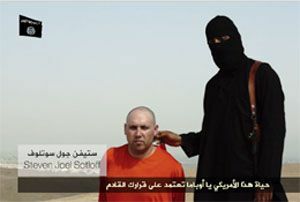 In the video, which I won't link to but have watched, U.S. journalist James Wright Foley is beheaded. Here is the FBI notice of Foley's kidnapping in Syria in 2012. In 2011, he was held by Libyan government forces. Any attempt by you, Obama, to deny the Muslims their right to live in safety under the Islamic Califphate will result in the bloodshed of your people.